After graduating from Arkansas-Monticelo, Derick Armstrong wanted to continue his football career, so he packed his bags and went to play in the CFL for the Edmonton Eskimos in 2001. After a solid 2002, when he put up 1104 yards in 18 games, the Houston Texans would sign him in 2003 to a free agent contract. He’d have his best season in 2005 connecting with David Carr for 29 receptions, 415 yards, and a TD. 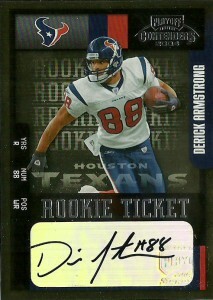 After a disastrous 2005 for the Texans, Armstrong decided to return to the CFL. Playing for the Winnipeg Blue Bombers, Armstrong played 4 seasons for them, recording back to back 1,000+ yard seasons in 2007 and 2008. Designated the team’s franchise ‘Import Player’ Armstrong refused to play. Winnipeg benched Derick and then cut him in 2010. Derick played one final season splitting time between the Lions with the Eskimos in 2010. Armstrong is a two time CFL All Star, earning honors in 2002 and 2007.